Something is wrong with Voyager’s bio-neural gel packs. In the meantime, it has somewhat belatedly occurred to Janeway that the Maquis crew-members who were never part of Starfleet and never went through basic training might need some… basic training. Janeway chooses Tuvok to train up a few troublemakers because, she says, Chakotay does’t need to earn their respect the way Tuvok does. Tuvok's response is to go full-on Drill Sergeant Nasty. And so, most of the episode (when it’s not dealing with the medical needs of bio-neural gel packs and cheese) is a by-the-numbers military-training story, complete with long runs, unfit recruits, a trainer who sticks rigidly to the rules until the dramatic final act and everyone learning something from each other and ending up friends. Tuvok even comes up with a 24th century equivalent of cleaning the bathroom with a toothbrush. In other words, it’s very, very dull. If the show was using this episode as a way to explore the dark side of Voyager’s situation and the difficult choices the crew were having to make, this might have worked. After all, there isn’t much else Janeway can do beyond find the Maquis crew work on her ship. She needs all the help she can get, and these four have been put through this training programme specifically because they are interfering with the running of the ship due to their lack of discipline, so she has good reason for needing to get them sorted out. The problem is that we’re expected to be entirely and unproblematically on Tuvok, Janeway and Chakotay’s side here in deciding that the best option is Starfleet-style basic training, with the Maquis crew-members clearly in the wrong for wanting no such thing, for who would not want to be part of the almighty Starfleet? At no point are these people offered any other option beyond confinement in the brig or being punched by Chakotay every day, while the fact that Kes and Neelix, while clearly making themselves useful, have not been forcibly enlisted into Starfleet is not remarked upon. That doesn’t sound entirely like a wonderful utopian future to me – it’s positively dystopian. 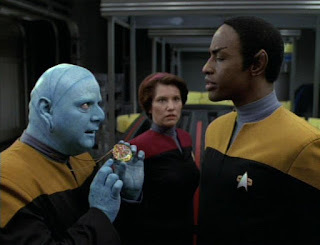 Things improve a bit when Tuvok follows Neelix’s advice and starts trying to understand the ‘recruits.’ The ending is obvious but satisfying, as Tuvok saves the young one’s life and shows that he does have a heart, and can bend the rules when necessary. But it’s really too late to save the episode, as we’re pretty much past caring by then. - We open with more of Janeway’s super-dull holo-novel that never gets finished. The Victorian children Henry and Beatrice are seriously creepy, especially Henry. I think he might have escaped from The Village of the Damned. - Still in the holo-novel, Janeway doesn’t know Latin, but plans to teach the children maths and the sciences. Worst. Governess. Ever. (I may be biased on that one). - Why does Tuvok moan about the Maquis woman’s headband? I’m pretty sure Ensign Ro wore a headband for years. I thought Bajoran earrings were allowed, as religious items, as well. Perhaps I’m confusing Starfleet with my old school. - The Doctor tries out his new and improved bedside manner on a bio-neural gel pack. It’s very funny. - Tuvok almost admits to having a ‘mood.’ This is what repeated exposure to Neelix will do to you. - The most memorable thing about this episode is the quotation about the cheese at the top of the page – and it’s remembered as a classic example of the occasional weakness of Voyager’s dialogue. And plots. Tuvok: Your first command together was less than successful. You are all dead. Neelix: Those Maquis aren’t Starfleet cadets, you can’t treat them the same way. Tuvok: You're saying that the Maquis crew is rigid and inflexible, that they will never adjust to Starfleet rules? Neelix: No, Mr. Vulcan. I'm saying that you are rigid and inflexible. But maybe if you'd learn to bend a little, you might have better luck with your class. Ethically problematic and, worse than that, boring. One out of four reluctant recruits to the military. Laugh out loud funny, Juliette. :) I always prefer to be positive if I can, but sometimes an episode just deserves a serious amount of snark -- and this one deserved it. My word, that's the last episode of season one! Congratulations on finishing your first season! This is one of the first episodes of Voyager I ever saw and one of the reasons I have always had a hard time liking this series. Although they were created for this show, the Maquis were better used and developed on DS9. On that show the Maquis had a clearly defined role and identity. On VOY they do not. The situation with the Maquis on the ship is like a relationship where one partner is made to sacrifice and change everything they are in order to make the other one happy. This is Janeway's ship and if they are to serve on it they have to conform completely to the Starfleet way of doing things. To put it another way, Janeway is the Borg, and the Maquis will be assimilated into her crew whether they like it or not. Resistance is futile. "At no point are these people offered any other option beyond confinement in the brig or being punched by Chakotay every day, while the fact that Kes and Neelix, while clearly making themselves useful, have not been forcibly enlisted into Starfleet is not remarked upon." Is it a bad thing that I would have enjoyed the show a lot more with daily Chakotay punchings? He could wear novelty t-shirts about how "beatings will continue until morale improves". Or if he has read up on the mirror universe, setting up an agony booth will prevent swelling of his knuckles. For the Bajoran earrings, if you remember Ro's first appearance, Riker had her take them off to conform to Starfleet dress code. And the episode ended with Ro telling Pikard that he would have to make at least one concession (while putting the earring back on). As for being forced into Starfleet, I suspect that with better show writers we probably would have seen that these "recruits" had volunteered for ship (Starfleet) duties, but were then being disruptive. As you mention, Neelix, Kes (and 7 of 9) contributed to the ship without being part of the Starfleet organization. Thanks Billie! I meant to mention something about it being the last episode of the season in the review and forgot - but season 2 opens with some episodes held back from the end of season 1, so I can talk about it then! Mark, did you enjoy violent thug Chakotay in Living Witness? That's one of my favourite episodes!